You'll enjoy its lightweight UI that gives you maximum editing space and less clutter coding experience on your Windows Mac OS and Linux platform. You can move side panes at will, and navigate freely with the all new minimap. Soft Characters and Matching Braces feature will add closing brace automatically when you type an open brace. Komodo Edit’s included API Catalogs enable autocomplete and call tips for 3rd party libraries like PyWin32 and jQuery. Komodo Edit allows you to customize everything, and extend with over 100 available add-ons. Vi and emacs key bindings included out of the box. 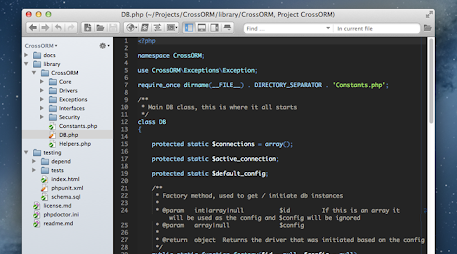 Komodo IDE supports code profiling of Python and PHP applications. This allows you to easily code profile an application in order to see where the hotspots are. Komodo also supports the Cachegrind/Callgrind specification, so you can open up generic cachegrind profile files and view them with Komodo's code profiler tools. The Code Browser will only show the outline for the currently edited file, though you can easily change this to show all files if you wish. The code browser can now be automatically synced with your current editor position, meaning the code browser will update it's context as you move around in the editor. When debugging an application inside of Komodo IDE, the watch and variable windows will now highlight any variables that have changed from the last break position, so as you stepping over your code, you can now easily tell when a variable has changed. Stackato is ActiveState's cloud hosting platform. Komodo provides tools that will allow you to easily configure, develop, manage and deploy applications to the Stackato cloud platform. Use the "Tools > Stackato" menu to launch the Stackato interface.